There were no hats that Dante Alighieri couldn’t wear. As a prominent Italian poet, philosopher, thinker, inventor and political intellect, Dante’s masterpieces, including the Divine Comedy, monumentally shaped the Renaissance and modern world of literature. Before his exile, he resided in his family’s home in Florence, which now serves as a museum open to the public. Here’s your guide to the history of Casa di Dante and the most notable rooms to visit. Why is Dante Alighieri famous? What is Casa di Dante? What can you see in Casa di Dante? 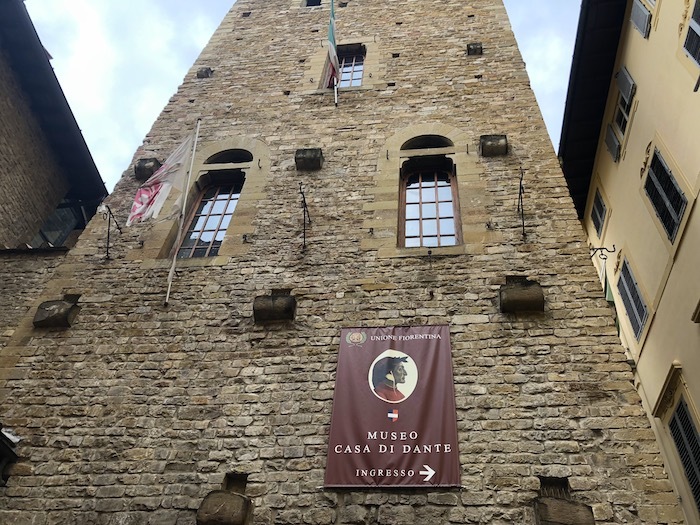 Discover the façade of Casa di Dante among other attractions on our Half Day Florence Walking Tour. 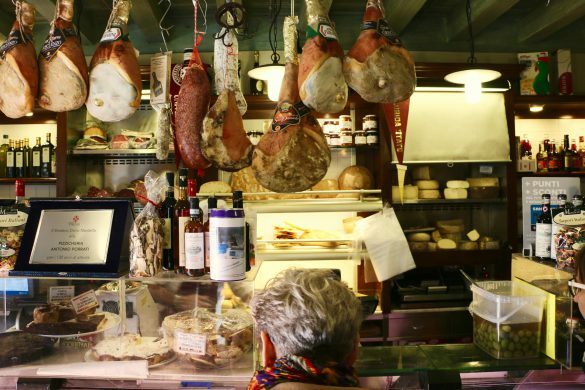 With skip-the-line access and a tour guide to lead the way, you’ll experience the best Florence landmarks and learn the rich history of the city. 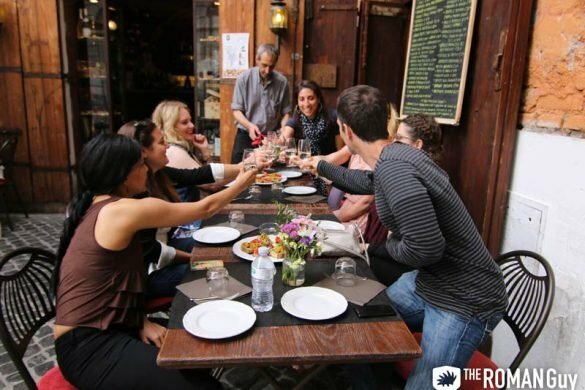 Check out our other Florence tours as well to make sure you make the most of your time in the City of the Renaissance. Born in late 13th century Florence, Dante influenced the theories, political beliefs and literature during and after the Renaissance era. Although Dante meticulously practiced writing in his early life, he later rose to fame as the author of one of the greatest works of literature, the Divine Comedy. He divided the poem in three cantiche—Inferno, Purgatory and Paradise. From Hell, Dante envisioned dark times; from Purgatory, Dante relinquished his sins; and from Paradise, Dante found everlasting tranquility. He illustrated Florentine culture while examining problematic themes of life. Dante chose to write the Divine Comedy in an Italian dialect as opposed to the conventional Latin language of the time. This aspect of his masterpiece, along with the philosophy and ingenuity intertwined into his poetic writing, paved the way for future writers, thinkers and inventors. Dante wrote the Divine Comedy while in exile from Florence. Conflict between the Ghibellines and Guelphs—two political parties divided by the Church—increased during his early adult career, and he freely spoke his political beliefs on the subject. However, in 1302, he was exiled from Florence while serving as a prior over the city due to intense disagreements with opposing parties. He passed away twenty years later in Ravenna, though his revolutionary literature and inventive spirit still live on. Originally, part of the house was sold to the Mardolli family, though it was later renovated and sold as property. The subsequent centuries were filled with the reselling of that part of the house until the government decided to buy the entire property back and reinstate its status in 1865. This project was delayed due to the political era in the late 19th century. At the time, Florence was the capital of Italy, but this quickly changed when the Italian government replaced it with Rome in 1871. 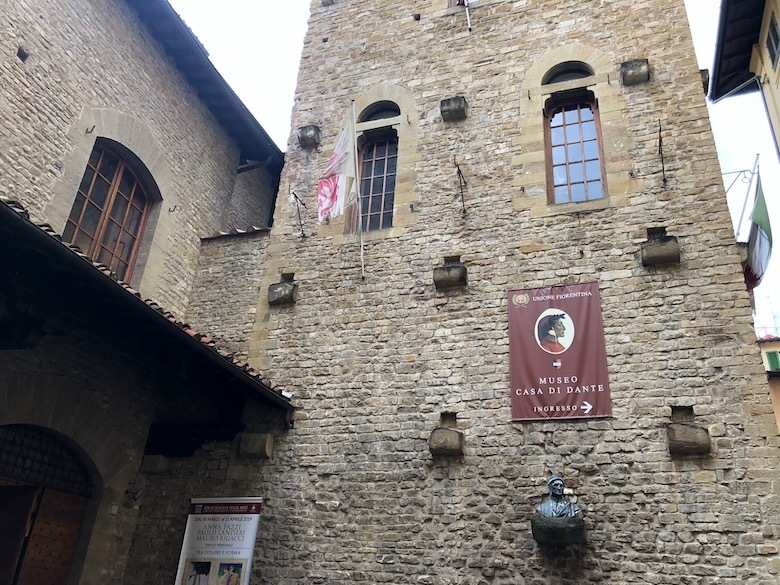 The political climate led to a decrease in funds for the government in Florence to reinstate Casa di Dante. 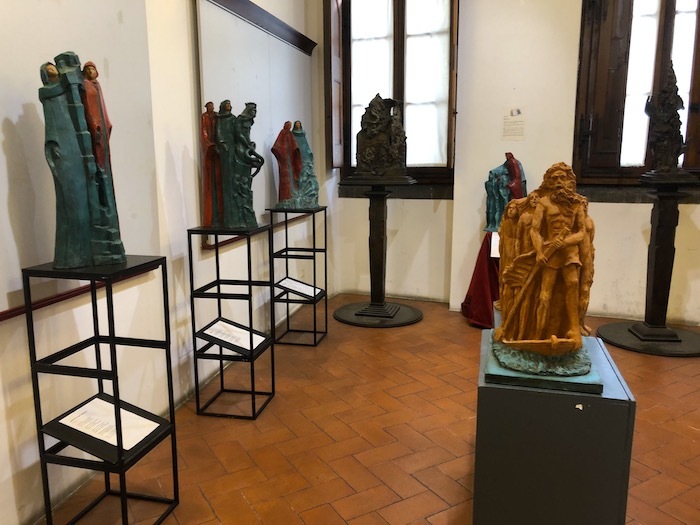 However, the project began again in 1911, and this house serves as a museum for visitors to learn about Dante and the effect of the political, social and economic status of Florence on his writing. The house is divided into three floors. 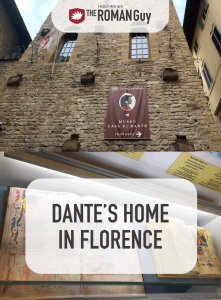 Each has an array of rooms dedicated to the history of Dante and Florence. The first floor houses several rooms displaying late 13th century Florence through political, economic and societal lenses. Entering through the first room provides visitors with additional information on the Guild of Physicians and Apothecaries, an association to which Dante belonged. Plants and other minerals are displayed to show ingredients the guild used to create various medications. These Medieval practices are adjacent to several tiles and paintings which depict classic styles of buildings, sculptures and paintings. The political realm of the floor is expressed through a panel in the center of the room. The city of Florence is thoroughly separated into segments, which represented the division of the city, especially during the war. The economic room displays antiquities imperative to Florence’s industrialization. From currency to jeweler’s tools to the trade routes, this room explains the history behind their attainment of wealth. 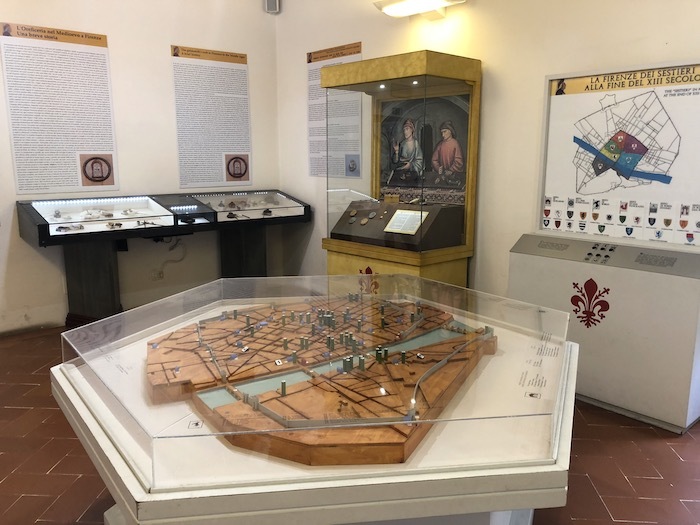 The last room on this floor has a diorama dedicated to the Battle of Campaldino, in which the Ghibellines and Guelphs viciously fought. After the Guelphs conquered in 1289, the war came to a halt and Tuscany was officially ruled by Guelphs. This floor is devoted to the events in Dante’s life that affected his career. One of the rooms is dedicated to Dante’s exile and contains the “Book of the Nail.” This wood-covered book denotes the written allegations of Dante and his exile from Florence. A video by Gustave Doré showcases the Divine Comedy in one room, while another room displays the bedroom of a typical upper-class citizen in Florence. Both of these aid in showing the life of Dante in his household. 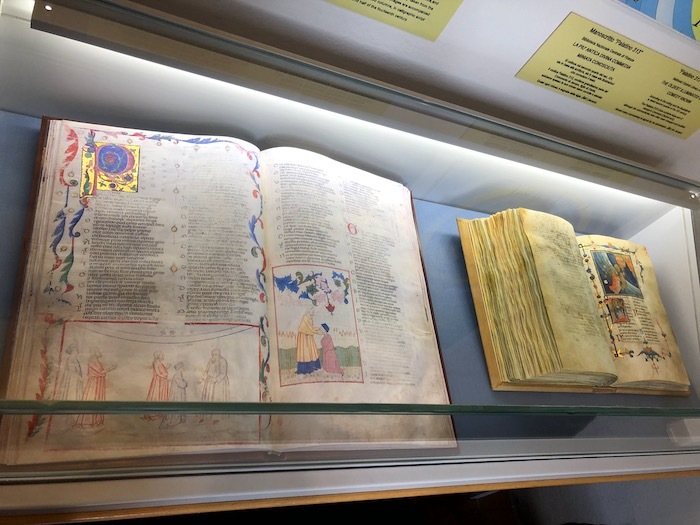 The final floor displays three authentic copies of the Divine Comedy—the earliest copy from 1337 and the latest from 1899. Each of these incorporate color and are protected by a glass cover due to their condition. Nonetheless, they are beautiful in their vivid pictures and ink text. It’s worth walking a few extra stairs to reach this destination. The final room in the top floor illustrates traditional noble garments worn by a notary and his wife. 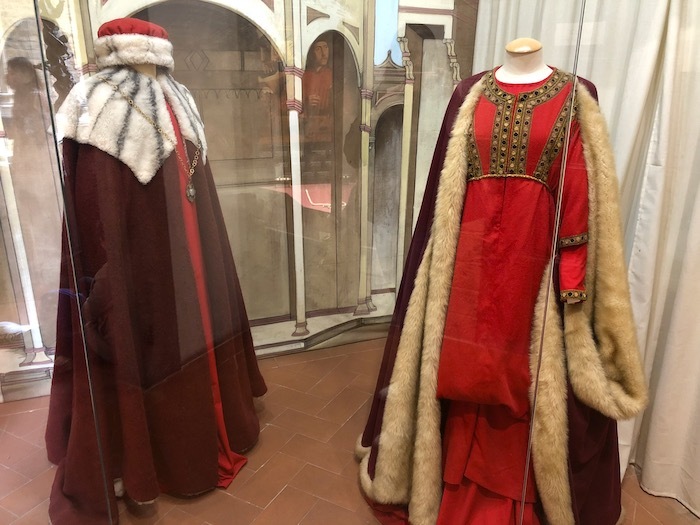 These provide historical context to the scene of the Divine Comedy. 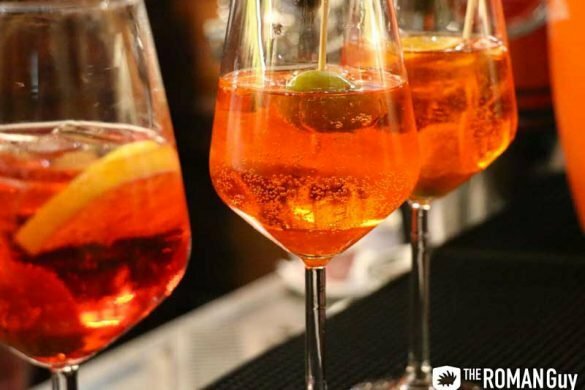 Casa di Dante Hours: Every day from 10 a.m. to 6 p.m.